Folder Redirection once thought as the holy grail of user data controls from a Windows point of view, once labeled as the solution to all SYS admin problems with roaming profiles. It may not solve all of our problems, but it does provide sys admins with more robust and flexible means of controlling users data. If you have ever used Folder Redirection in a Microsoft environment, you may have noticed strange behaviors where certain applications will not synchronize as intended. While this may be expected in some scenarios; there are plenty of limitations where files do not synchronize or are excluded from the synchronization process because of possible corruption. I feel the technology is just not there yet, but there have been plenty of improvements with the release of Windows Vista, Windows 7, and Server 2008. Now let’s take a look at how to reduce the number of synchronization errors when a known file type has been determined. First thing is to look at how files can be excluded from the synchronization process, this refers to files that are cached onto local machines and synchronize back to the server once there has been a modification made onto them. To configure this policy we will have to visit our Group Policy Management Editor, and browse down to Administrative Templates within the Computer Configuration. 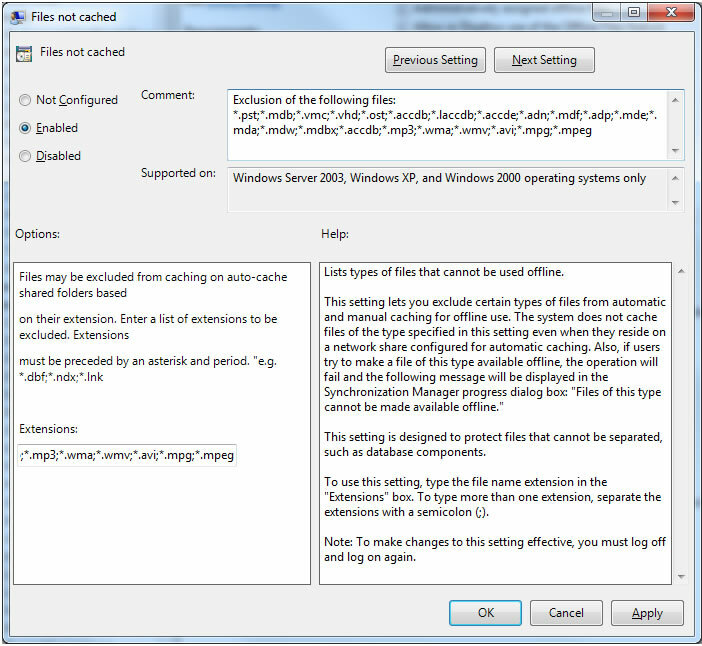 Expand Network, expand Offline Files, and configure Files not cached. Some files types are not even supported by Microsoft when accessed through a network, hence I dread the thought of continuing to support .pst files. There are plenty of other ways to manage PST files throughout the enterprise and I’ll be writing a follow up article to tackle ways to lock down users from creating PST files.